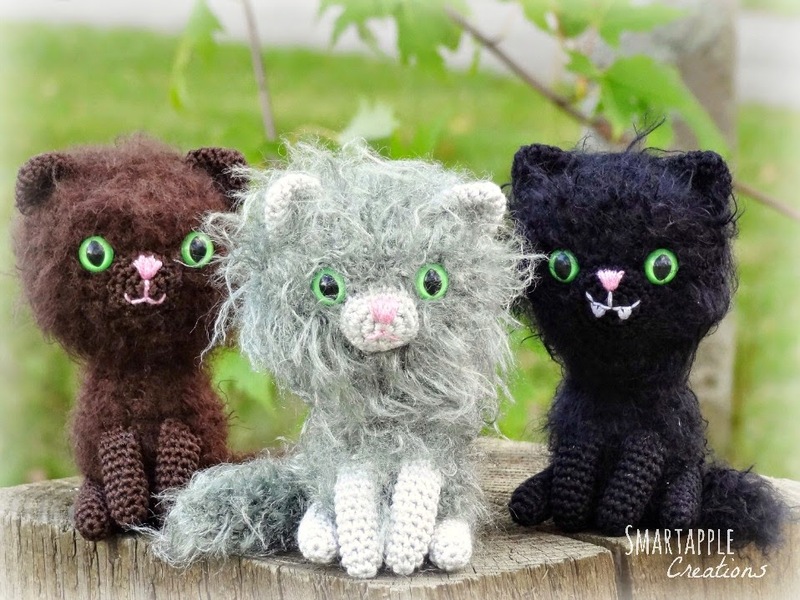 It has been a year since I made my first attempt to write a crochet pattern for a tiny amigurumi kitten. 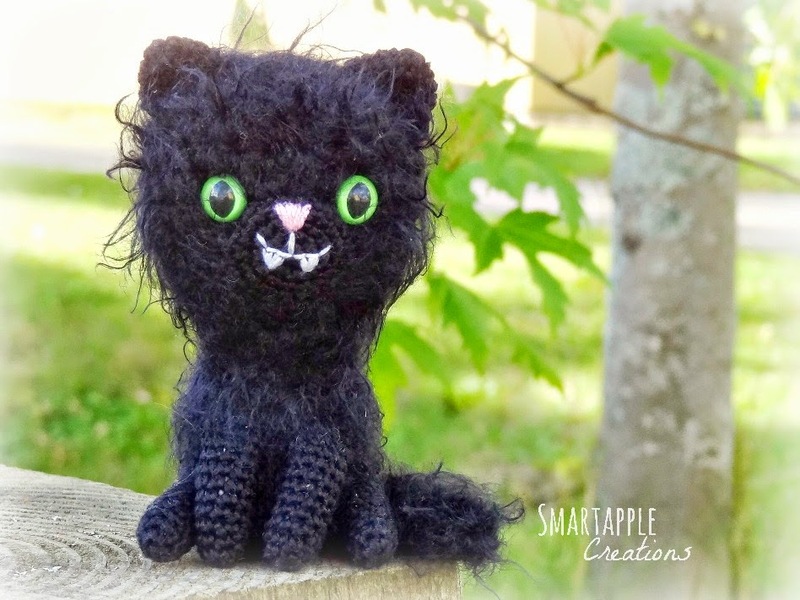 Halloween was just coming and I thought that a cute and scary fuzzy black kitten would be a great idea for a free pattern. Now I have gained much more experiences and I have established my own pattern writing style. Therefore the pattern needed a little update. I changed some bits a pieces here and there and also added some photos of the process. 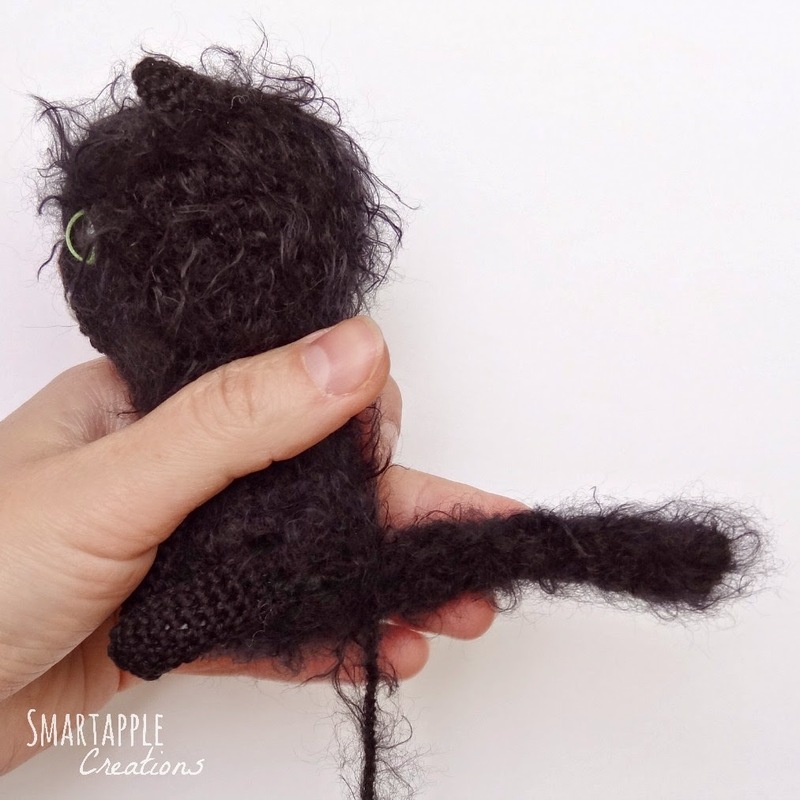 The pattern itself is an easy one but using black fuzzy yarn makes it a bit tricky. It is really hard to keep track of the stitches but fortunately you cannot see the mistakes later. Although, if something goes terribly wrong and you need to unravel a couple of rows, it is almost impossible (at least with the yarn I used). Nüüd on sellest juba aasta möödas, kui kirjutasin valmis oma esimese heegeldamise juhendi pisikese kassipoja tegemiseks. Halloween oli siis just ukse eest ja mulle tundus, et on hea mõte teha tasuta juhend just ühe veidi hirmuäratava, kuid samas väga armsa karvase kassipoja heegeldamiseks. Nüüdseks olen palju kogenum ning mul on välja kujunenud ka oma juhendi kirjutamise stiil. Seepärast vajas juhend väikest värskenduskuuri. Muutsin juhendis natuke siit ja natuke sealt ning lisasin ka pilte tööprotsessist. Juhend iseenesest on lihtne, kuid veidi keeruliseks teeb selle musta karvase lõnga kasutamine. Väga keeruline on aru saada, kus mingi silmus on, kuid õnneks pole vigu hiljem näha. Kuigi, kui midagi peaks ikka väga valesti minema ja mõni rida on vaja üles harutada, siis on see üsna võimatu (vähemalt selle lõnga puhul, mida mina kasutasin). 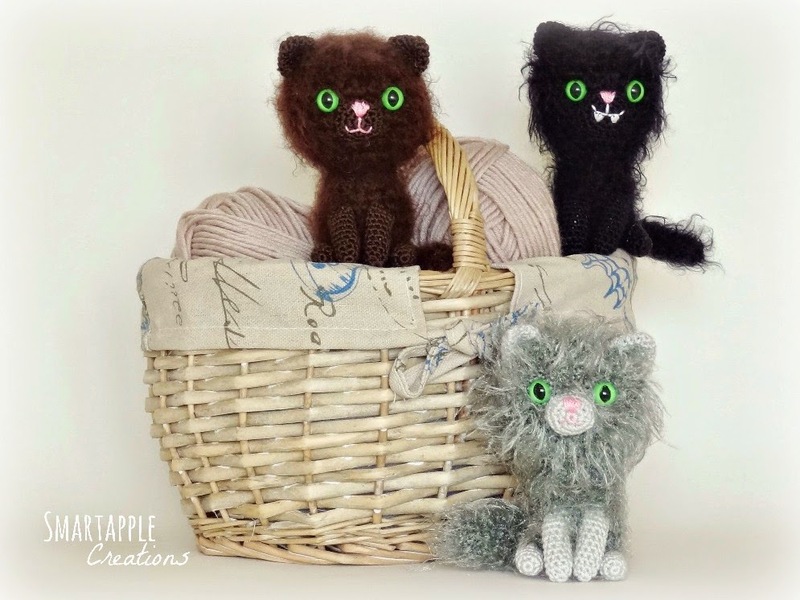 I had at home a skein of brown and grey fuzzy yarn and I made two more kittens. The brown yarn was of the same type as the black fyzzy yarn but the grey was much fuzzier (I think it is also called eyelash yarn). Although the colour is lighter the grey yarn was even more difficult to work with. It felt like I was blind because I could not see any of the stitches. Actually I crocheted quite randomly and somehow I succeded to get a kitten out of it. This yarn was finer and I had to make some adjustments to the pattern to get the kitten the same size. I also tried out some different faces for the kittens. The grey cat has a pointier nose and I did not make the "vampire teeth". All the kittens are very soft and silky. My baby girl giggles every time I tickle her nose with the kitten's tail. My kids also like to hug and stroke the cats gently. Mul oli kodus veel üks tokk pruuni ja halli karvast lõnga ka, nii et tegin kaks kassipoega veel. Pruun lõng on sama mark, mis must, kuid hall lõng oli palju karvasem. Kuigi värv on heledam, oli halli lõngaga veel raskem heegeldada. Vahepeal tundus, et ma olen pime, sest ma ei suutnud ühtegi silmust eristada. Heegeldasin üsna suvaliselt, kuid kuidagi õnnestus kassipoeg ikkagi välja võluda. Hall karvane lõng oli peenem ja pidin mustrit veidi kohandama, et sama suur kassipoeg saada. Samuti proovisin kassipoegadele teha ka veidi erinevaid nägusid. Hall kiisu sai omale teravama nina ja vampiirihambaid ma ei teinud. Kõik kassid on väga pehmed ja siidised. Mu pisem tütar alati itsitab, kui ma tema nina kiisu sabaga kõditan. Mõlemale lapsele meeldib neid kallistada ja hellalt silitada. Inglisekeelse juhendi kassipoja heegeldamiseks leiad allpool. 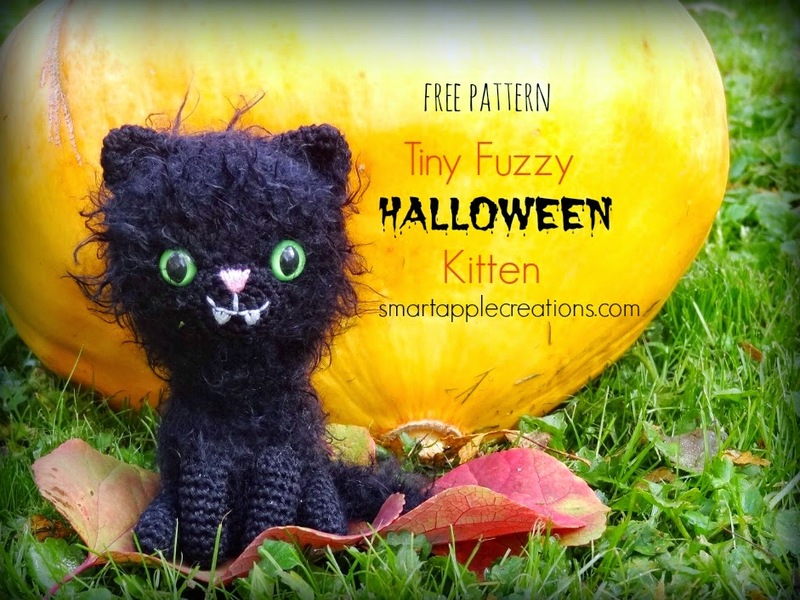 Here comes the tiny fuzzy Halloween kitten pattern for the adventurous crocheters who are up for the challenge. Important! It is prohibited to sell the pattern, you are welcome to share the pattern on your website or blog if you credit Smartapple Creations as the designer and add a link to my website http://smartapplecreations.blogspot.com. If you would like to translate the pattern, you need to ask for my permission first. You may sell the finished items made according to the pattern. - Crochet in continuous spiral through both loops. 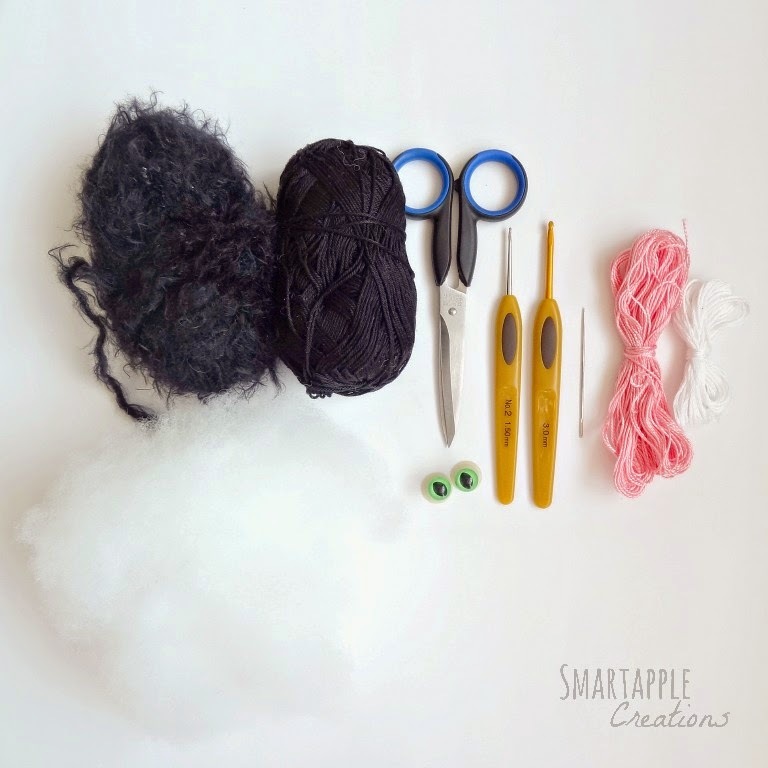 - Use a stitch marker or a piece of yarn to mark the ending of the round. Move the stitch marker after finishing each round. - Pattern is written using standard US crocheting terms. slip stitch, single crochet stitch, increasing, decreasing, crocheting in rounds. Fasten off and leave a long tail for sewing. Embroider the nose with pink embroidery floss, mouth and teeth with white embroidery floss. Flatten the top of the ear and crochet the opening shut with 8 slst through front loops. Fasten off and leave a long tail for sewing. Insert the safety eyes between rounds 6 and 7 leaving 4 or 5 sts between them and fasten with the washers. Stuff the head. Form a little semi-cirlce of the ear, position the ears to the sides between rounds 3 and 7 and sew them on. Continue to crochet the body. Fasten off. Pick up the remaining stitches and pull the center tightly closed. Hide the yarn tail inside the body. Position the muzzle to the face between the eyes and sew it on. Stuff the leg. Flatten the top of the leg and crochet the opening shut with 4sc through both loops. Fasten off and leave a long tail for sewing. Position two legs on to the front of the body and two legs to the sides of the body, sew them on. Your cat will sit neatly and the legs will not stick out if you attach the legs to the body with a few stitches also in the middle of the legs. Hide the yarn tails inside the body. Fasten off and leave a long tail for sewing. Sew the tail on to the back of the body. Congratulations, your kitten is ready! If you liked this pattern check out also my pattern stores on Ravelry, Craftsy or Etsy for my other cute patterns. Follow me also on Facebook or Instagram. If you have any questions or comments to the pattern, feel free to send me an e-mail or write in the comments below. Send me the pictures of your kitten by email or share them on my Facebook page for others to enjoy as well! Copyright © SmartappleCreations. Simple theme. Powered by Blogger.